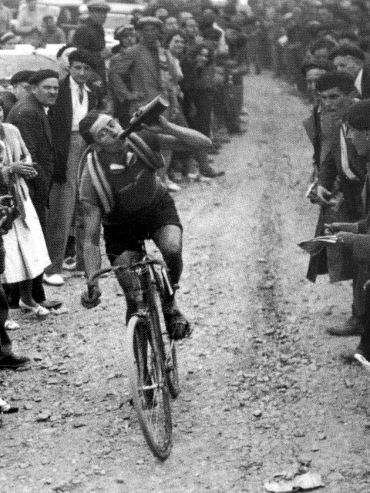 Long before the glamour of modern professional cycling, the riders of the Tour de France were a special breed of badass men. They would endure a crazy amount of pain and suffering and do whatever it took to make it through. The conditions these guys were under wouldn’t compare to anything we know of today. The gear, the nutrition and the general disorganisation of the early days is fascinating and sometimes quite amusing. Let’s have a look at what cycling used to be like. It’s fair to say that nutritional science has come a long way since the early days of the Tour de France. Today’s pro teams include chefs and nutritionists dedicated to optimising every milligram of micro and macro nutrients consumed by their riders. 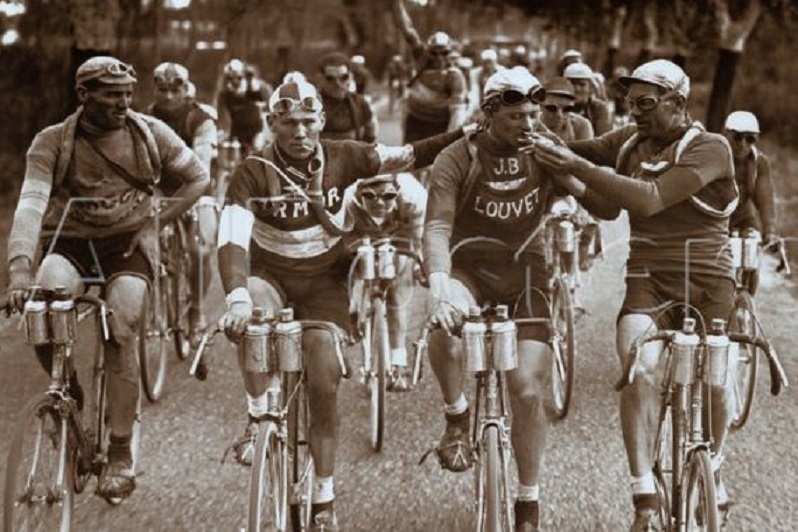 Back in the day things were quite different… In the early years, when riders made their way from start to finish without the support of a team, they would have to stop along the way to refuel. This made for some rather interesting diets. Lunch of champions: Robert Jacquinot having a bowl of soup, a loaf of bread and a couple of reds. He had 482 km to cover that day. Henri Cornet, the youngest ever winner of the Tour, was only a week away from his twentieth birthday when he won the 1904 race. Nevertheless, his diet was more suited for the biggest of grown men. According to The Science of the Tour de France: Training Secrets of the World’s Best Cyclists, Cornet’s daily ration consisted of 1.5 kilos of rice pudding, four litres of tea, 11 litres of hot chocolate and some champagne to top things off. 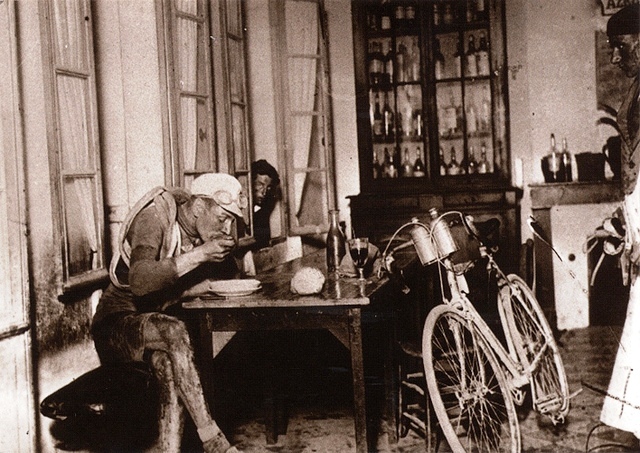 Riders Henri Colle and Charles Parel having a pit stop at a local tavern during the 1921 Tour de France. Alcohol consumption was actually quite common during the Tour until the 1960s. 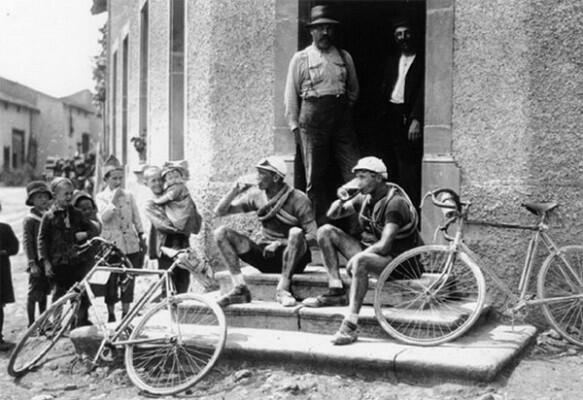 Beer and champagne were in fashion, for the purposes of hydration and making the ride more fun. During the 17th stage of the 1935 Tour de France, riders passed through a small town where locals had set up tables full of beer bottles. As the peloton stopped to enjoy the surprise refreshments, the winner of the stage, Julien Moinreau, skipped the alcohol break and managed to finish 15 minutes and 33 seconds ahead of the peloton. Although Moinreau never admitted to it, there is speculation that he knew about the enticing mid-race beer stop. He had organised his own water supplies beyond the beer stop and had equipped his bike with a 52-tooth chain ring, instead of the usual 44-tooth ring, so he could keep up his speed when riding alone. Smoking was another popular performance enhancer in the early days of the Tour. 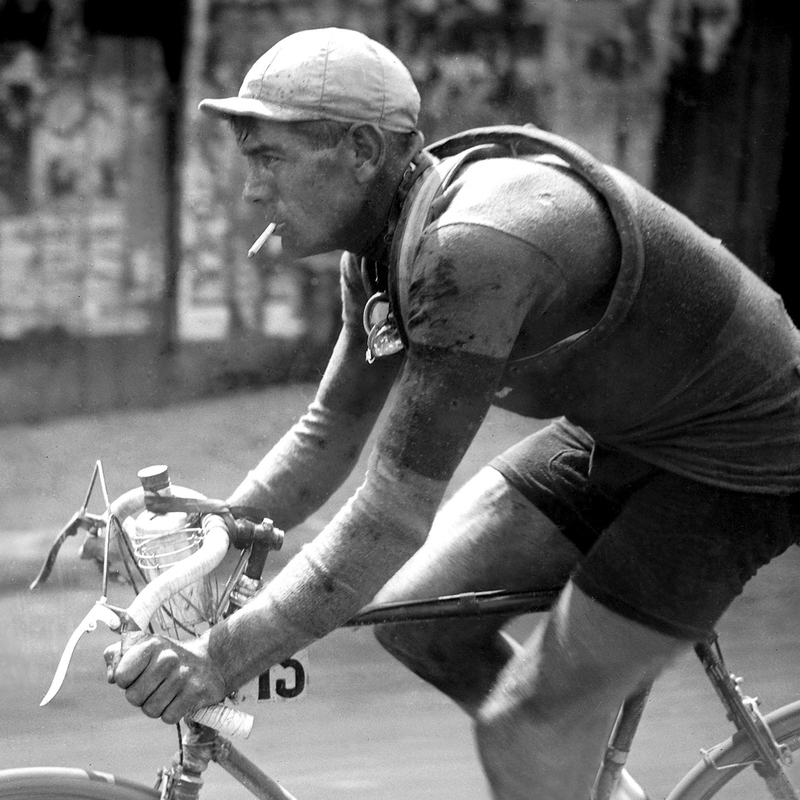 It was believed that cigarette smoking would help open up the lungs, so riders would often have a quick ciggie before big climbs. 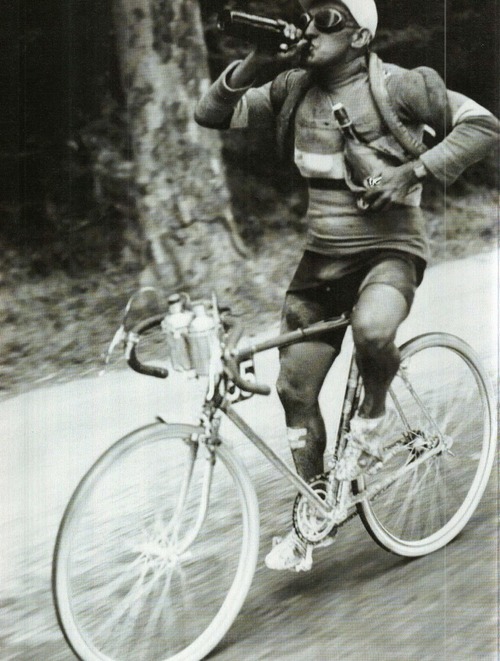 Tour de France 1927: Gustaaf van Slembrouck enjoying a cigarette. Today’s lightweight cycling gear is a far cry from the equipment of old school cycling. 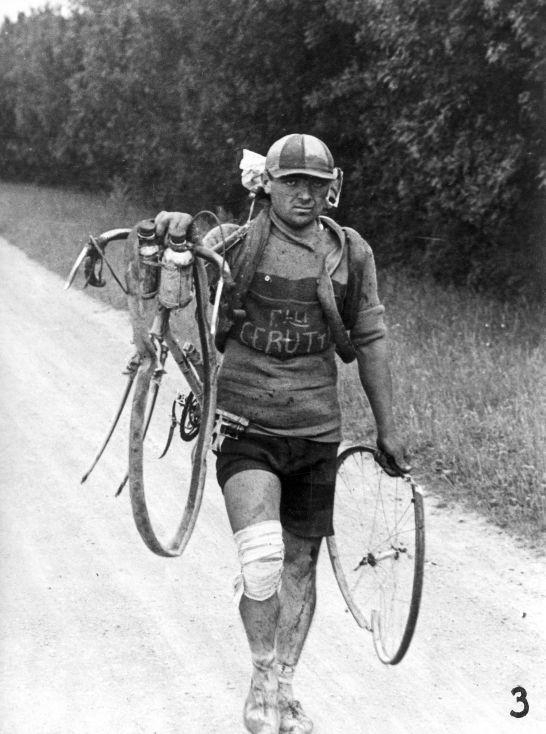 Before there were any carbon fibre bikes, teardrop helmets, lycra kits and support cars loaded with spare versions of everything imaginable, riders had to make it on their own and carry what they needed. The images below say it all. Tour de France 1926: in the early days cyclists rode around France in only 6 stages (inspired by 6-day velodrome racing), which resulted in some grueling daily distances of more than 400 km. This stage started at 2 am, and by 10 pm only 30 riders had reached the finish line. 15 riders were still going the next morning. What do you do if your bike breaks down? You walk. Derailleurs were used for the first time in 1937. Before then riders would stop and change their back wheels before big climbs (unless they could grow massive calves). The Tour got a bad reputation through the nineties and naughties because of the rampant use of performance enhancing drugs like EPO. However, doping has always been part of cycling, and in the early days it was actually allowed! A mixture of drugs were seen as necessary to be able to complete the race. Until the 1960s, riders used substances such as alcohol, ether, strychnine, cocaine, chloroform, nitro-glycerine and amphetamines to dull their pain and reduce the sense of fatigue from the long and excruciating 18-hour stages. The average stage distance of the very first Tour was over 400 kilometres – riders were given three days to recover between stages. Alcohol consumption to dull the pain and fatigue was standard during the first five decades of the Tour. The unorganised nature of the early days the Tour made it easy and tempting for riders and spectators to meddle with the rules. Cheating was widespread and spectator favourites would also get a helping hand by onlookers. 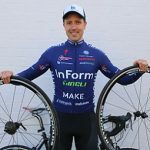 When you read the word mechanical doping you might be thinking of bikes with concealed motors, which have received attention in recent years. 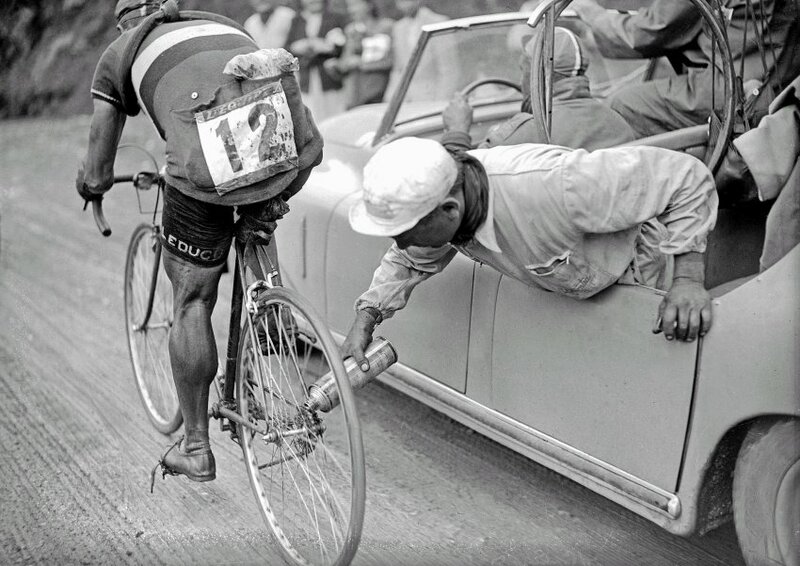 In the early versions the Tour de France, mechanical doping was much more basic and at times comical. The winner of the first two Tours in 1903 and 1904, chimney sweeper Maurice Garin, was later disqualified for taking the train for parts of stages (no wonder he finished three hours ahead of the nearest competitor). Other riders were ousted for being dragged behind cars via a long wire attached to a bottle cork, which they would hold in their mouth. The cork could easily be spat out if the riders encountered potential witnesses. 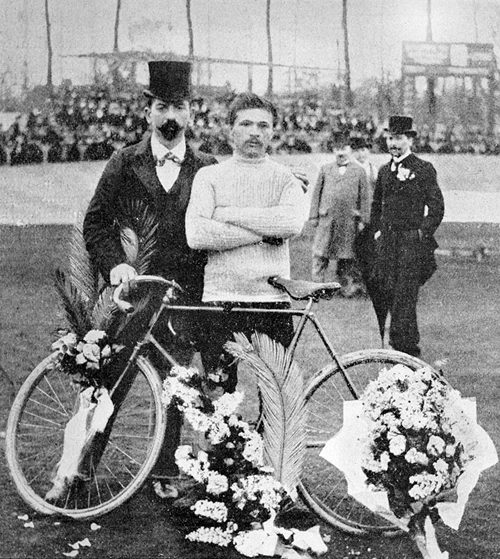 The winner of the first Tour in 1903, Maurice Garin. The passion of the local cycling fans didn’t really compare to today either. 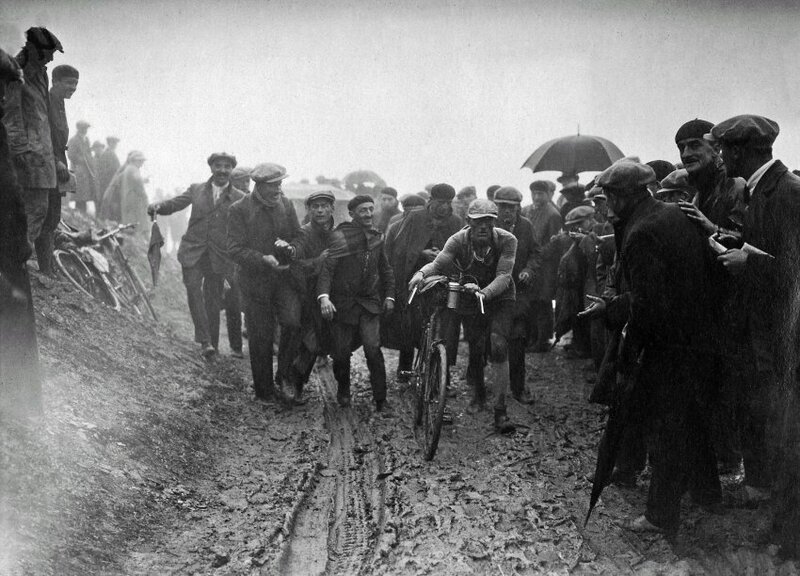 In 1903 spectators threw nails on the road in an attempt to sabotage the last stage (Garin, the winner, rode the last 40 km on flat tyres) and a crowd beat up riders outside Saint-Étienne. The crowd broke up only when Maurice Garin fired his gun in the air! Old school cycling definitely was a far cry from anything we know of today! You may also like: Tour de France Prize Money – How Much Does the Winner Get?